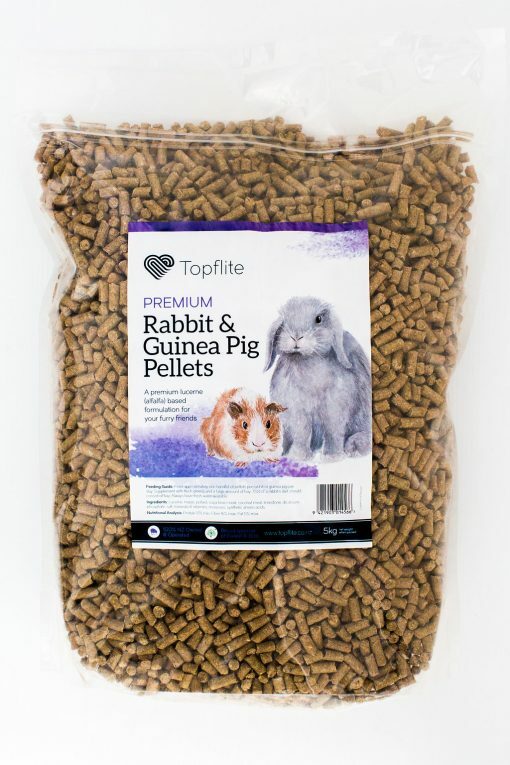 Premium Rabbit Pellets | Topflite Ltd. These rabbit pellets are designed around lucerne meal, a proven natural ingredient essential for successful rabbit diets. Lucerne meal provides both quality protein and digestible fibre, important for intestinal physiology and freedom from digestive upset. Rabbit pellets are formulated to provide a balance of essential nutrients required for growth, reproduction, and general health. Ingredients: Lucerne, Maize, Pollard, Soya Bean Meal, Coconut Meal, Limestone, Dicalcium Phosphate, Salt, Minerals & Vitamins, Molasses, Synthetic, Amino acids. NB: Does not contain coccidiostat.